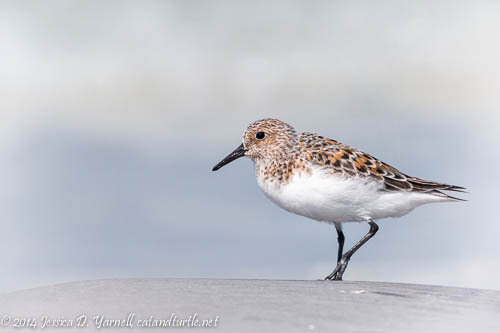 Sanderlings are small shorebirds that often run along the edges of the waves. In the wintertime their backs are a pale gray, but in May they burst into a bright red-brown. It’s very pretty, especially if one will stand still long enough to take his picture! 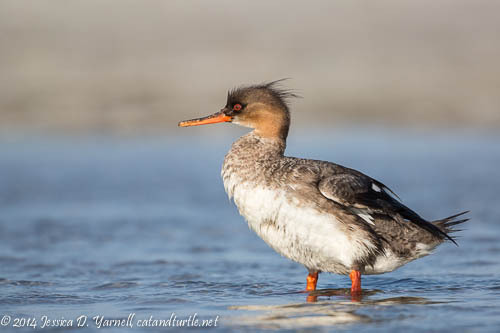 It’s been a good spring for Red-breasted Mergansers at Fort De Soto. I’ve been amazed at how tame these birds as, swimming right past the groups of crazy photographers with our tripods in the water. In April there were several dozen birds, almost all females (or juveniles). Some of my friends got shots of a male, but I missed him. So on the morning that I photographed the Least Terns, I was very happy to see this juvenile male sunning himself at the edge of the water. See, sometimes it pays to get wet and see the good birds! I’d love to see a male in full breeding colors. For this year I’ll have to be content with this guy, whose head is starting to turn dark black. 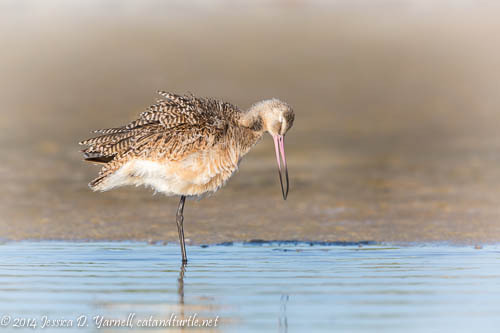 The Long-billed Curlew left Fort De Soto a while back, and I haven’t seen or heard about the Whimbrel since I saw him on Easter weekend. But the Marbled Godwits were still hanging around in mid-May. They like to sleep on one leg with their heads tucked under their wings, so they are often rather boring subjects. This one was preening (on one leg, of course!) I caught him in the best pose, looking as if he was in the middle of a sneeze. God bless you! 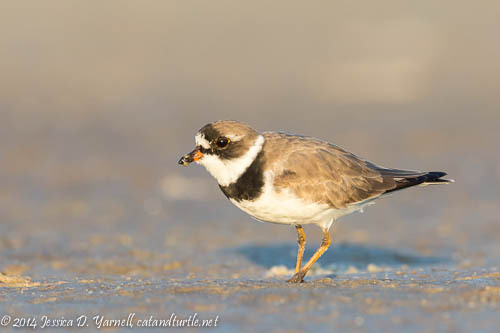 The Semipalmated Plovers really start to look good in the spring. Their chest and head bands deepen to a dark black, and their little orange patches on the nose make them look pretty cute! 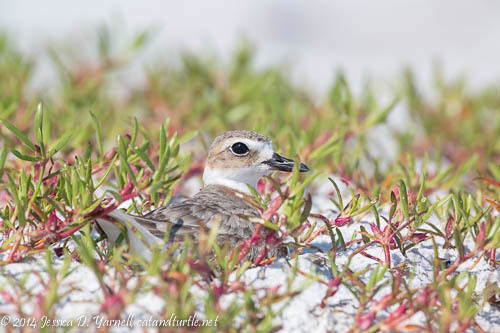 They are not to be confused with the Wilson’s Plovers (below). Both types of plovers were running around North Beach on this morning. They are fast and hard to catch! You got the last of the great shots for this season. There were just a couple of shorebirds there on Wednesday. 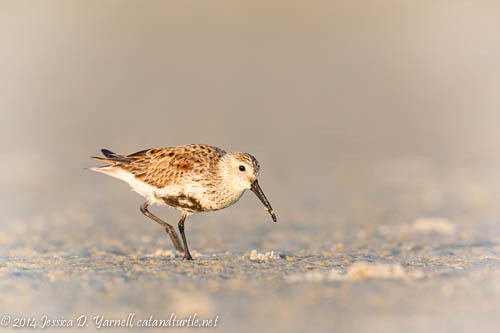 A really nice series of shorebirds! Nothing like laying in wet mud and sand waiting for a bird to turn its head just … a … little … more … there!